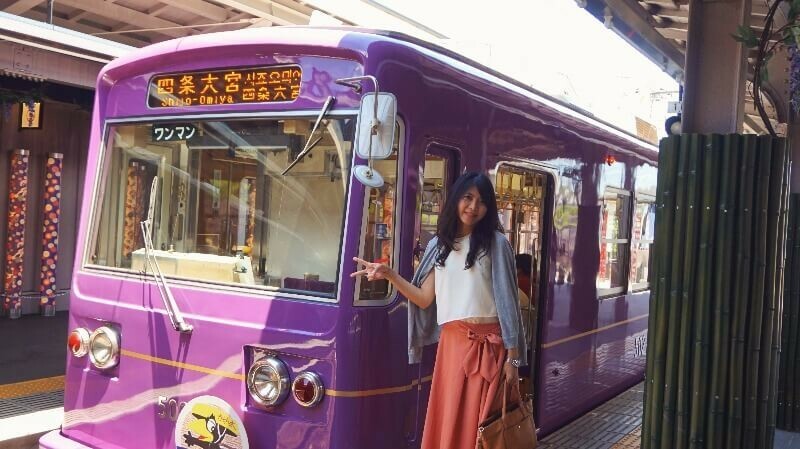 Did you know that you can conveniently get from Arashiyama to the World Heritage Site Ninna-ji Temple by taking a tram? There are many temples and shrines in Kyoto, but many of them are crowded because so many tourists visit Kyoto every day. 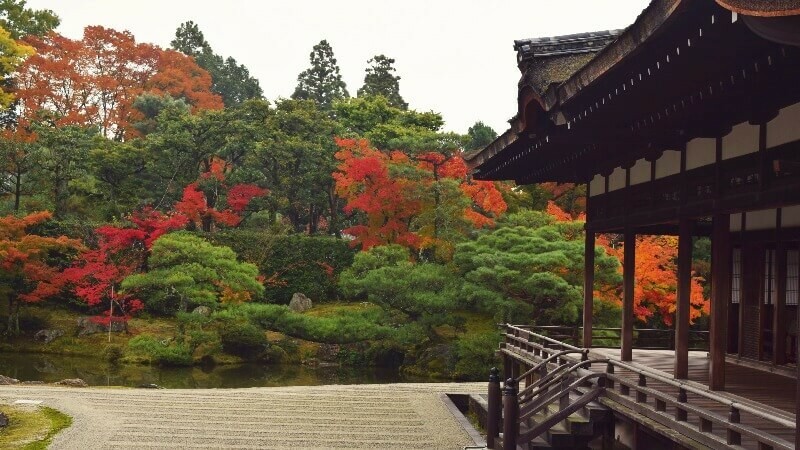 But worry not, there are some great places in Kyoto that are not crowded, but Ninna-ji Temple is on a completely different level: this temple is a World Heritage Site and still it’s not crowded, but actually a relaxing place to have a stroll around a Japanese garden! 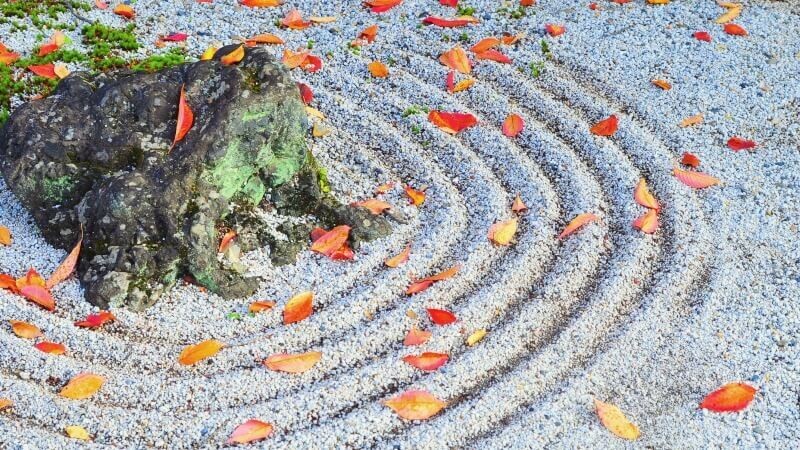 So, come join our writer Vanessa on her journey to find out what it is about Ninna-ji that makes it so appealing. 1At noon, start from Arashiyama! 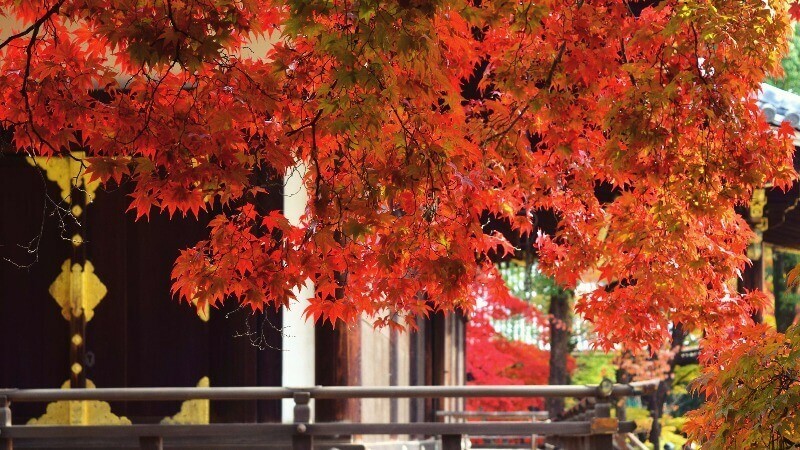 Everyone knows that Arashiyama is a great place that you have to visit, but it’s also one of the most crowded in Kyoto. 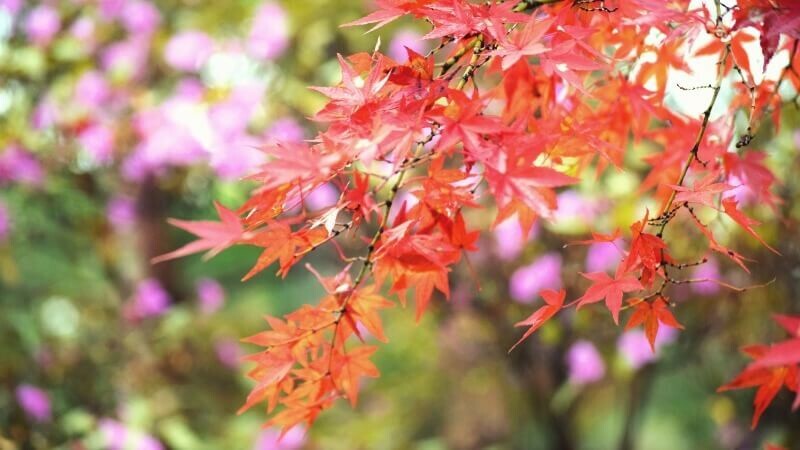 So, Vanessa’s recommendation is to go to Arashiyama in the morning, and then head for Ninna-ji Temple in the afternoon! 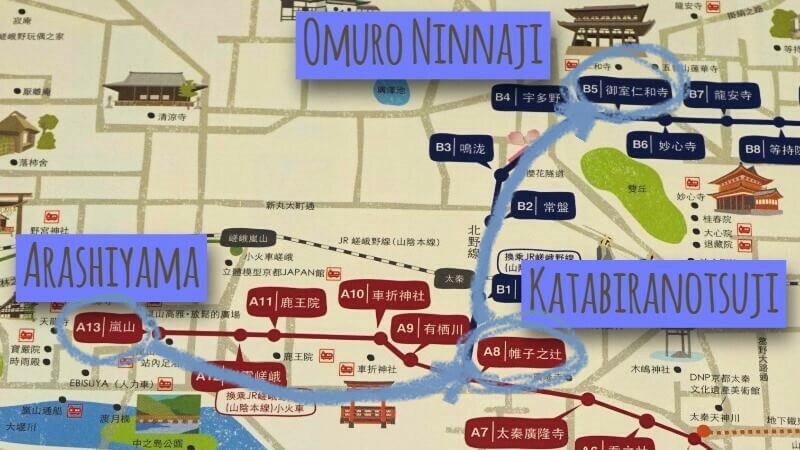 The station that is closest to Ninna-ji is Omuro Ninna-ji, and it takes about 15 minutes to get to this Station from Arashiyama. 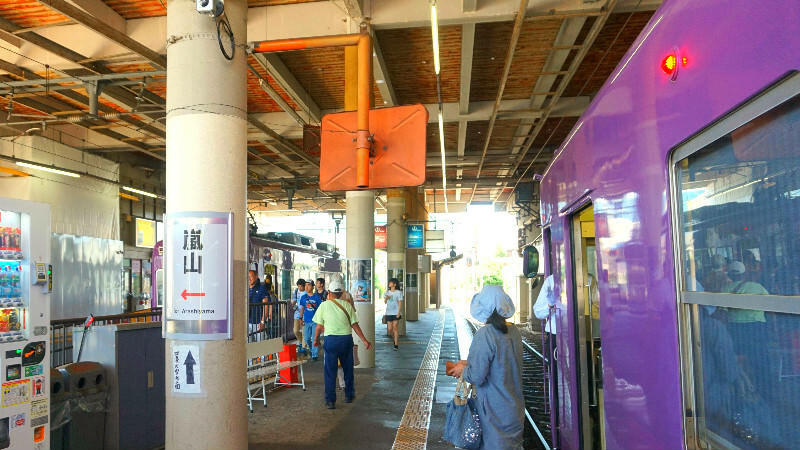 Note that you need to change trams at Katabiranotsuji Station. After you get off at Katabiranotsuji Station, go to the tram opposite of you going towards Kitano-Hakubaicho Station. The tram ride to Omuro Ninna-ji Station doesn’t feel like a long time as you get to see beautiful scenery out of the tram windows. All of Randen’s stations are small, and I think they are also cute. First, you get to see this huge Niomon Gate of Ninna-ji Temple. The gate is 18.7 meters tall, and it’s called one of the three great gates of Kyoto along with those of Chion-in and Nanzen-ji. On both sides of the gate, you can see a statue, these are called Kongorikishi. Because of these two statues the gate is called Niomon, the gate of the two kings. Photo time in the garden! 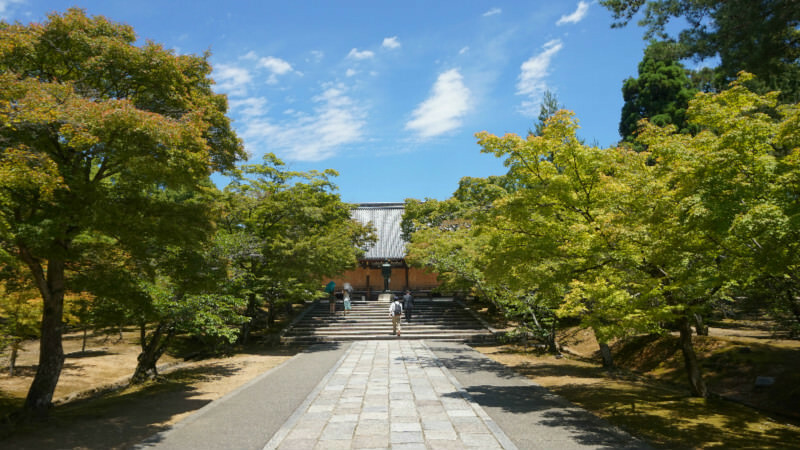 The best place to start your tour of the temple is from the Goten Palace! 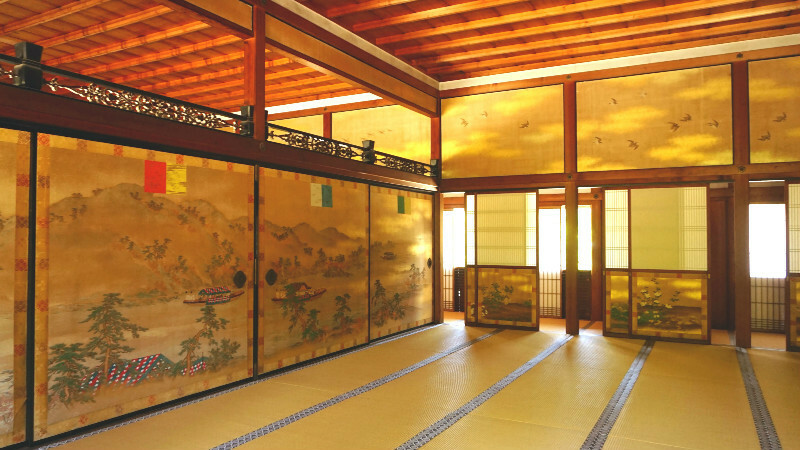 This palace used to be the abode of Emperor Uda, and the imperial feel is still present to this day. There are also two incredibly nice Japanese gardens. Many temples in Kyoto forbid you from taking photos, so it’s really nice to know that you can take as many photos as you want in Ninna-ji. They also have free Wi-Fi, so you get to upload your pictures straight to Facebook and Instagram. But remember that the Goten Palace is old, so be careful not to lean on things. After you go through the Niomon Gate, you will see a ticket counter on your left where you can buy a ticket for the Goten Palace for 500 yen. After going through the Honbo Omotemon Gate, you see the entrance to the palace. *Remember to take off your shoes before entering the Goten Palace. 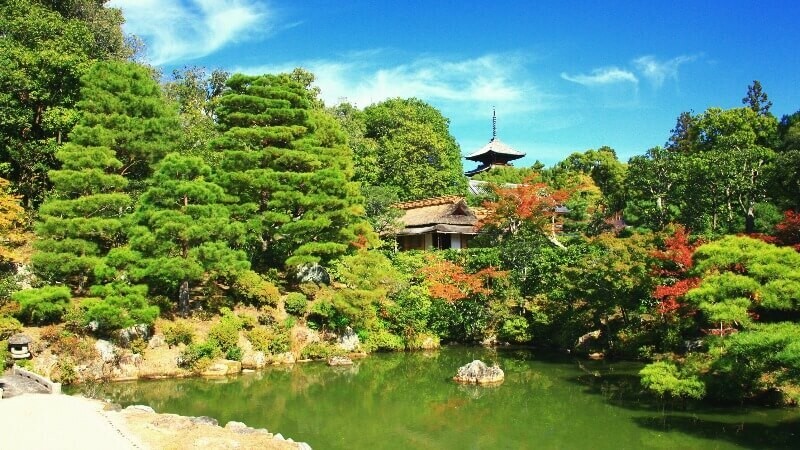 In the Goten Palace, the first thing you should do is take a picture of this beautiful rock garden, Nantei. Sit by the temple walkway, and take a break. 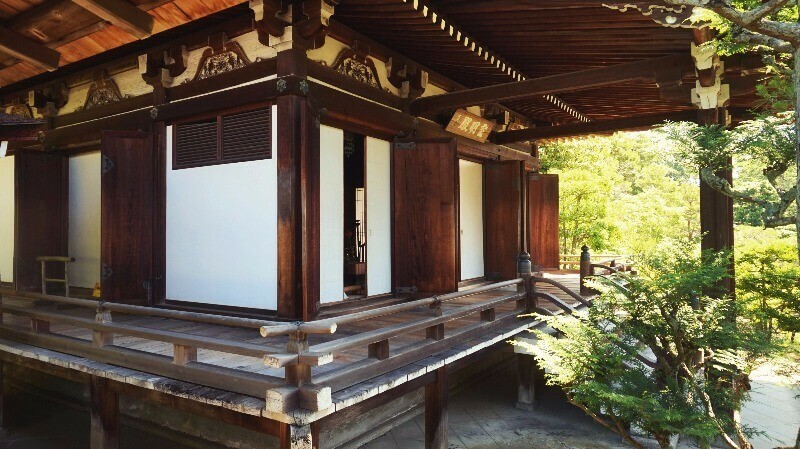 It’s easy to relax at Ninna-ji. From the Hokutei Garden you get a great view of the Five-Storied Pagoda. 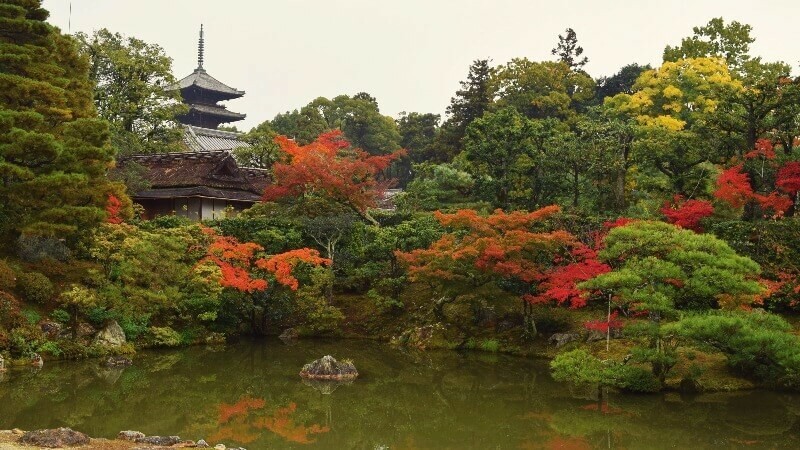 Only Ninna-ji in Kyoto has a garden from where you can see a five-storied pagoda, so be sure to take a picture of this incredible sight! 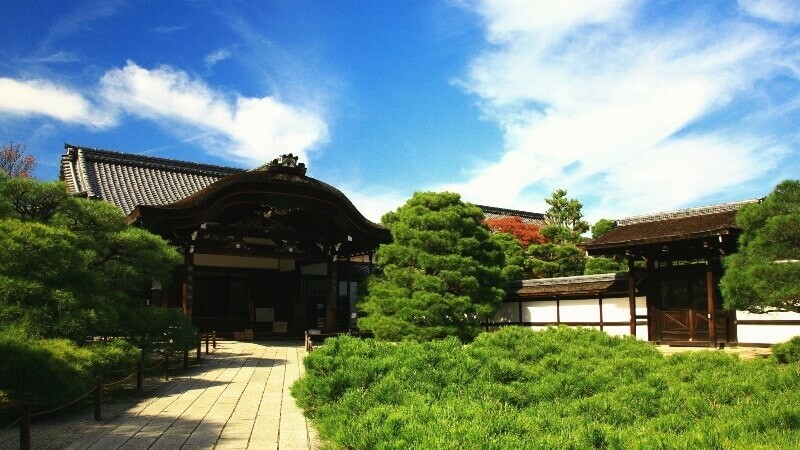 The Goten Palace is made up of four buildings, Shiroshoin, Shinden, Kuroshoin, and Reimeiden. This corridor leading to Reimeiden is a great place to take pictures. This corridor is often used as a filming location for Japanese movies and television series, so be sure to have your photo taken here. Note that there is an alarm that is activated if you go past the sliding doors, so be careful not to put your camera inside the doors. The sliding door paintings at Ninna-ji are so beautiful they make you stop right in your tracks. Besides the garden, these sliding doors are maybe the second best thing about the palace. Besides learning about the history of the temple and taking pictures, you can of course also get souvenirs. 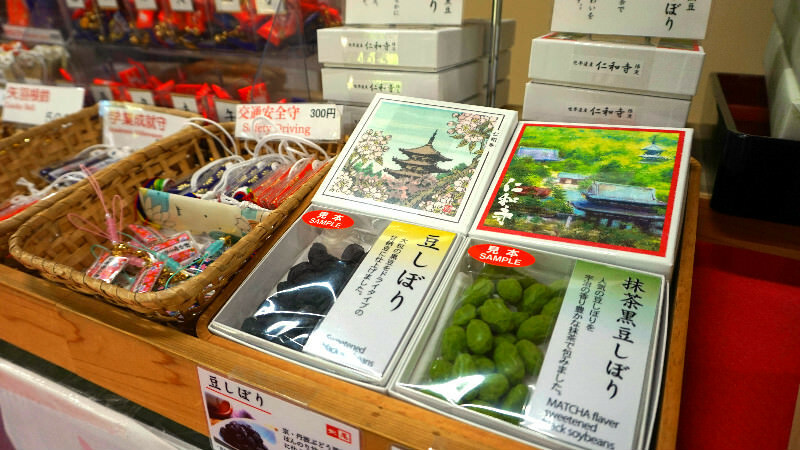 These beans are made in collaboration with a famous Kyoto sweets shop, and especially the matcha covered ones taste rather nice! And what more, the packages have pictures of Ninna-ji on them. *Time required: Around one and a half hour. 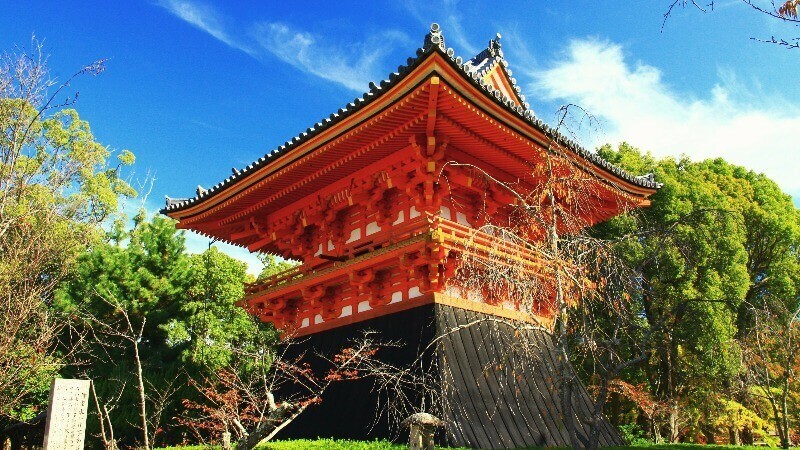 Ninna-ji is not only about the Goten Palace! There is a lot to see at the temple, like the Five-Storied Pagoda, and the Kondo main hall, so there are many great places to take pictures. 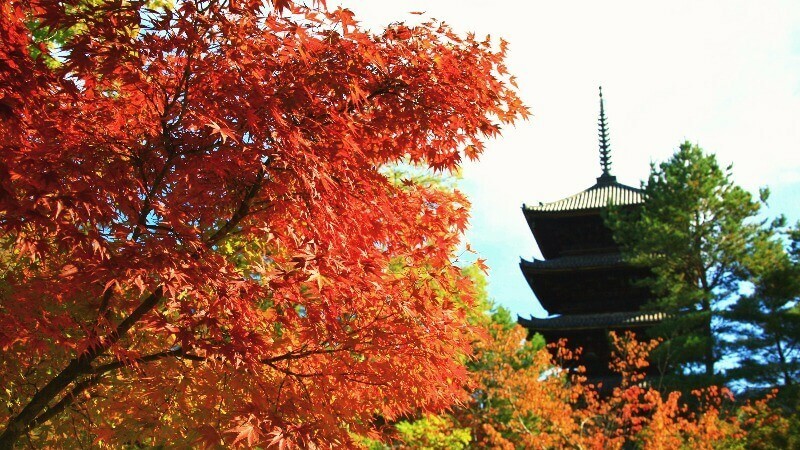 First, you of course need to go see the Five-Storied Pagoda of Ninna-ji. 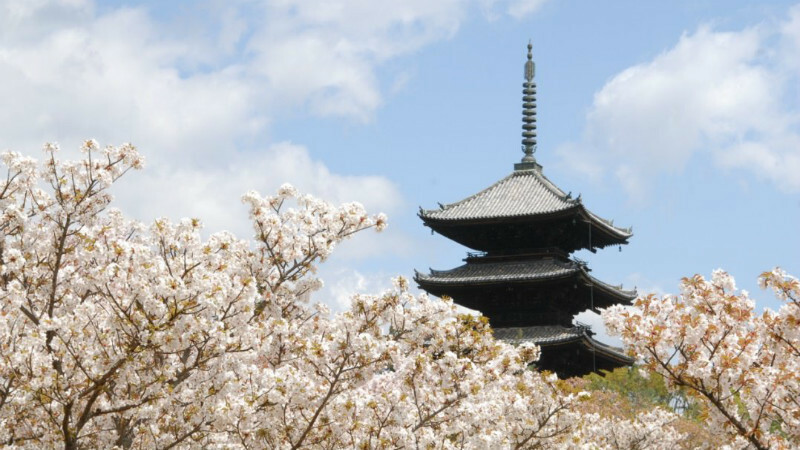 The pagoda is so pretty it’s often featured in Japanese movies. 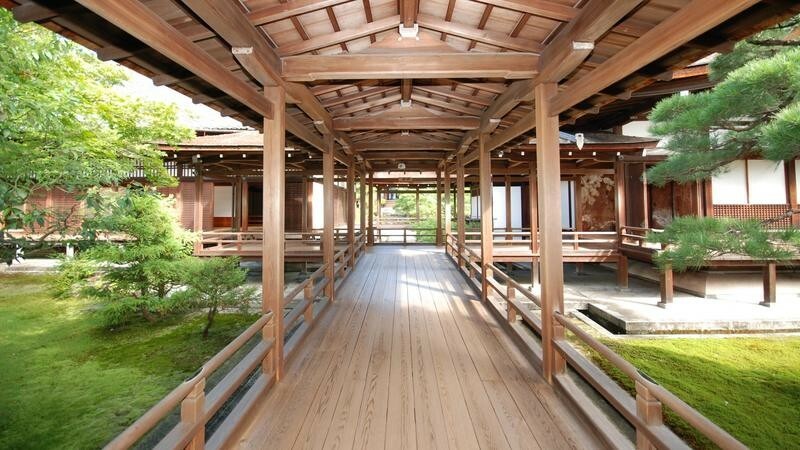 Next, the Kondo main hall, which is a national treasure of Japan. This is a rare example of imperial architecture, so be sure to take a proper look it! * Kondo is undergoing renovation works until December 2017. Don’t forget that you can also get a goshuin temple stamp book of memories at the temple! 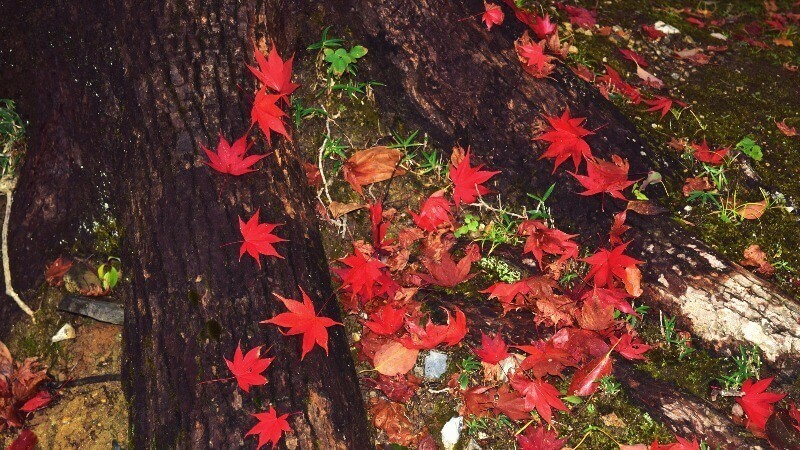 The goshuin stamps of Ninna-ji are works of art in themselves. 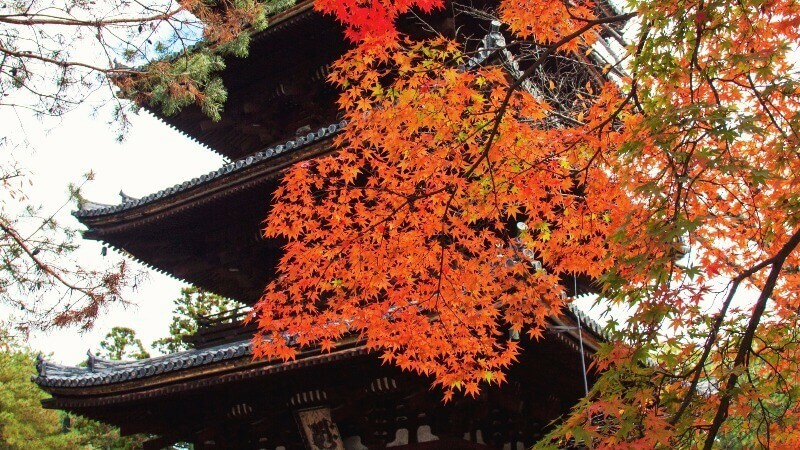 Ninna-ji’s Bell Tower is a cultural property of Japan. 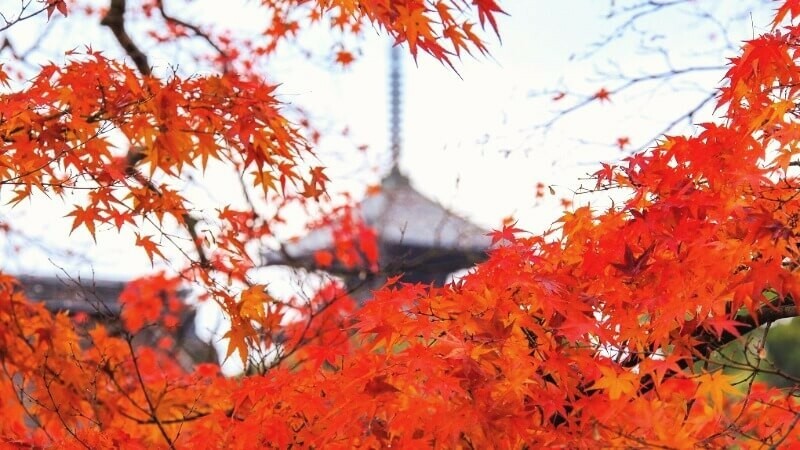 In autumn when the tower is surrounded by crimson autumn leaves it almost looks like the tower was in flames! There are also many other great places to see at the temple, like Miedo, which houses many important Buddhist scriptures and statues, and there are many other culturally important buildings too. 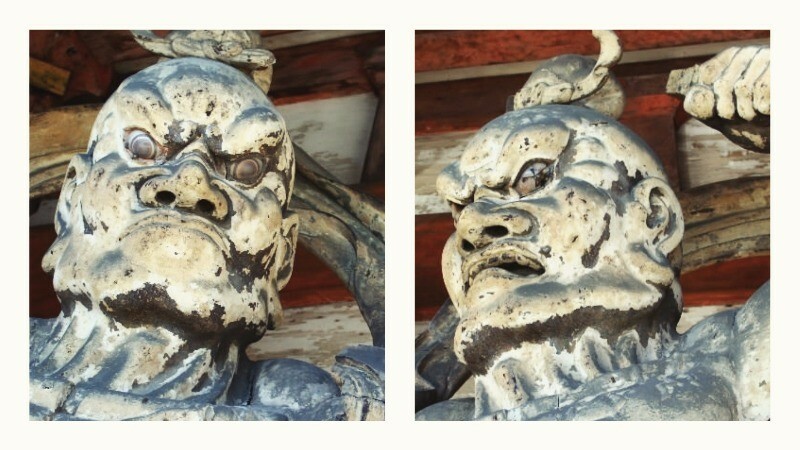 Ninna-ji is a temple offering endless opportunities for photography! 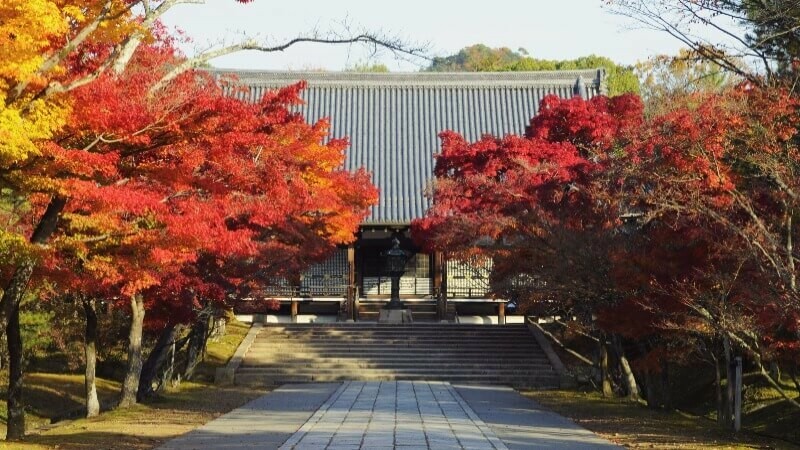 Which season should you go to Ninna-ji? I went to Ninna-ji in spring and actually got to see the Omuro Sakura: the pink and white blossoms were so pretty! Together with the temple they made me feel incredibly happy about deciding to come to Japan. In summer Ninna-ji feels refreshing, somehow the temple does not feel as hot as the rest of Kyoto. 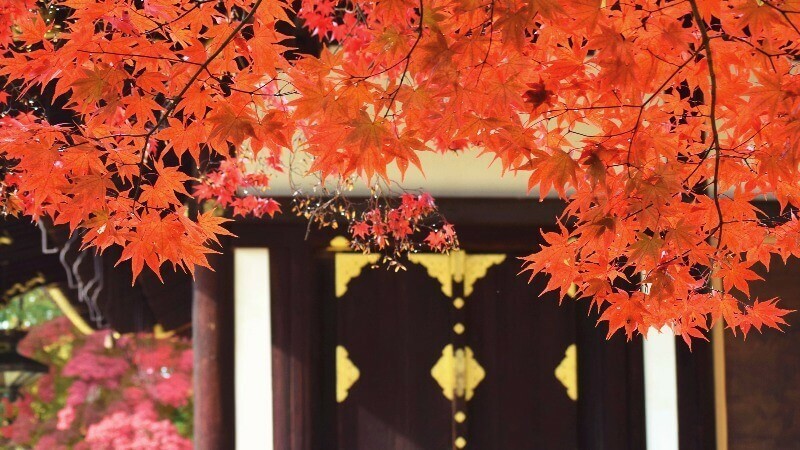 While Ninna-ji is most famous for its cherry blossoms, the autumn leaves of the temple are just as pretty. 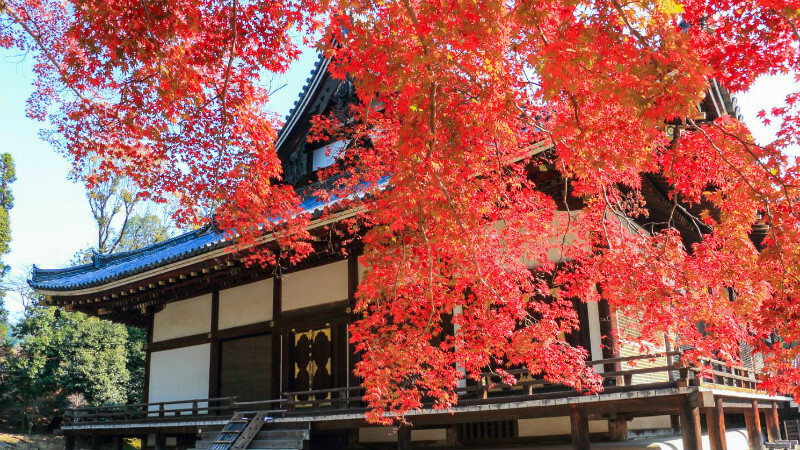 The way Ninna-ji is surrounded by red and yellow leaves is something everyone has to see at least once in their lifetime. 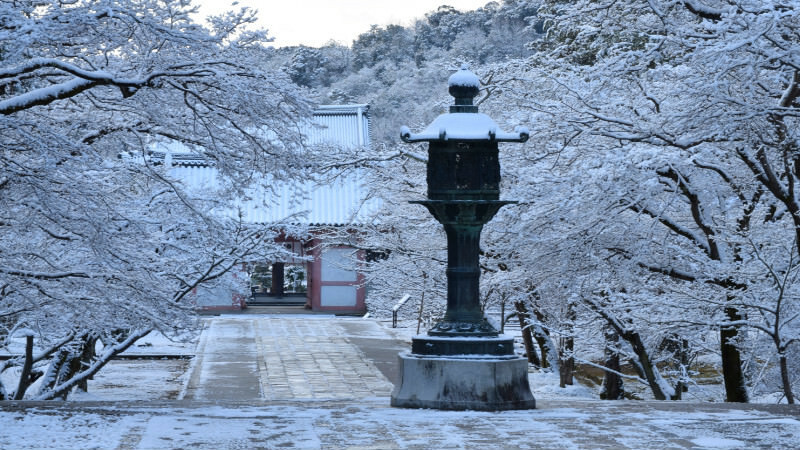 In winter, the temple takes on a completely new white look. This time I was in Ninna-ji in May, but because the temple takes on a new look each season, I’m really looking forward to getting to go to it again. So, it should have taken around three hours of your afternoon to see Ninna-ji Temple, and I hope you have enjoyed it! The temple is even bigger than you would think. Because many of the temples in Kyoto are almost overcrowded, it’s nice to know that there are still hidden gems like Ninna-ji. 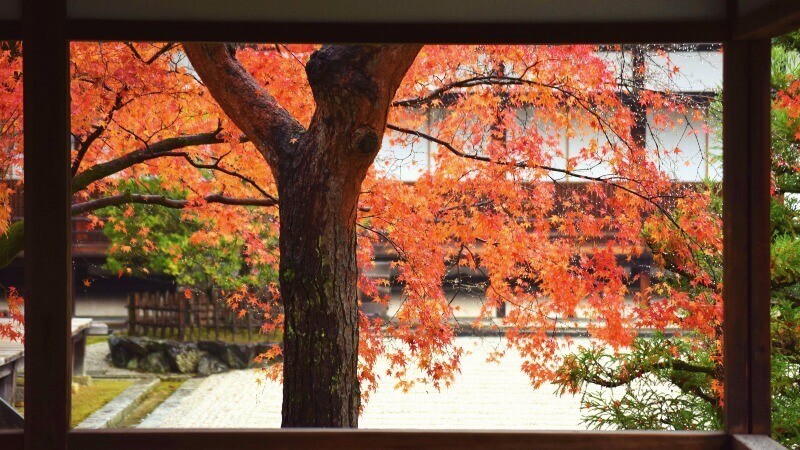 So, when you come to Kyoto, remember that Ninna-ji is the most relaxing of the temples of this ancient capital! 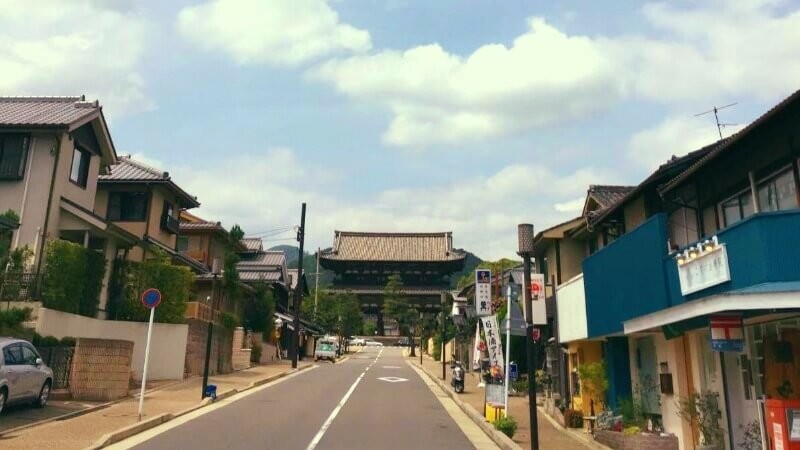 After you have seen Ninna-ji, you could continue on the Kinukake-no-michi path which leads to Ryoan-ji and Kinkaku-ji, or you could take a bus back to downtown Kyoto. So, this means that our day in Ninna-ji has come to an end! 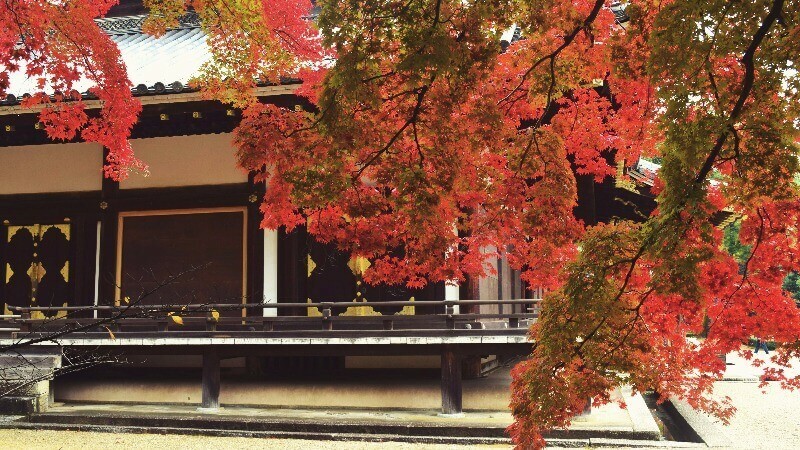 No matter the season, Ninna-ji is an incredibly beautiful temple. It’s one of the best temples I have been to in Japan, and there are many places to take pictures at the temple. 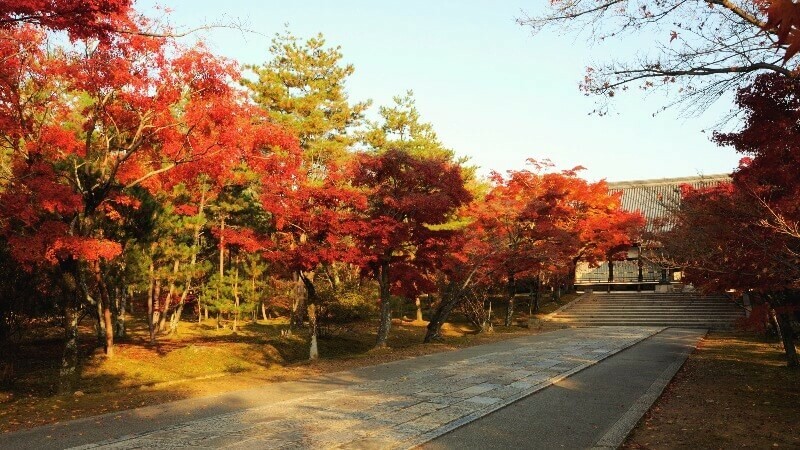 It is easily accessible from Arashiyama, so my recommendation would be to go to Arashiyama in the morning, and then leave the afternoon for Ninna-ji!